From the information I was provided, that does not seem to be the case. Could be a point of more research, withdrawing of course from getting the CES/E3 promos. Either way, it could be fun. Which arcade controller board are you referring to that will allow you to play arcade games on an FZ-35s? I think I know you from over on Assembler. bitrate wrote: Which arcade controller board are you referring to that will allow you to play arcade games on an FZ-35s? You need to provide some signals to the controller port of the FZ-35s to make the arcade games start. The easiest way to do that is to simply connect the controller pcb of the arcade unit to the FZ-35s. Another way would be to build a small circuit which fakes the signals. Daisy-chaining a couple of 3DO controllers may work as well, though I don't have enough controllers to test it. WindowsKiller wrote: You need to provide some signals to the controller port of the FZ-35s to make the arcade games start. Is that really all that's required to make the Konami arcade games run on an FZ-35s? Do you know what kind of signaling the FZ-35s is looking for on the controller port? Obviously, since you state that you think that regular 3DO control pads daisy-chained together might make it work, it is looking for 3DO control pad signaling, but do you happen to know specifically what it is looking for? Seems strange that all that is required to make these arcade games run on an FZ-35s is some 3DO control pad based signaling. I probably have about 50 3DO control pads so daisy-chanining a few together shouldn't be a problem. If we run into a wall there, and you know (or can find out) what the signal is supposed to look like, it should be a fairly straight-forward job to emulate that signal. Let me know what you think. No, no, that's of course not all which is required to get the games working. But it's the final step to make them start. 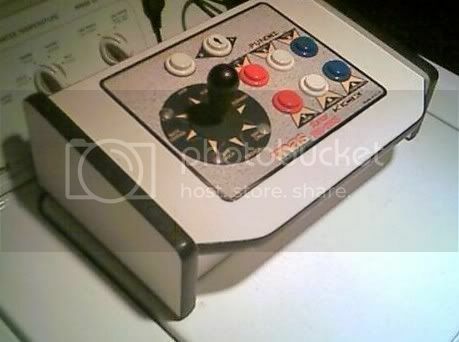 You have modded your washing machine to run via joystick input? Is that the highly coveted M2 washing machine ! How much do you want for it???? Actually, all joking aside, as we all know they made M2 kiosk units, M2 Russian ATM's, etc., so an M2 washing machine really isn't that much of a stretch. I can envision the marketing fluff of around the time for the washing machine... "Able to process 100 million loads per second". Gir Draxa wrote: Personally, I would go with the SUPER NOVA instead. The SuperGun was nice in it's day, but the Nova is much smoother. WindowsKiller wrote: You need to provide some signals to the controller port of the FZ-35s to make the arcade games start. The easiest way to do that is to simply connect the controller pcb of the arcade unit to the FZ-35s. Another way would be to build a small circuit which fakes the signals. Daisy-chaining a couple of 3DO controllers may work as well, though I don't have enough controllers to test it. Ahh... it's starting to make sense now. Any chance we know the protocol or does it need to be reversed from the arcade board? Also, are you still needing the FZ35 bios? jwhazel wrote: Any chance we know the protocol or does it need to be reversed from the arcade board? I don't know yet. I focused on disassembling the code to simply disable the part of the code that waits for the signals instead, but I can't do that without a copy of IDA 4.5 Advanced (the M2 ELF loader will only work with that version). jwhazel wrote: Also, are you still needing the FZ35 bios? I don't need it anymore, as I know everything I wanted to know about the boot process now. It would be nice to have it nevertheless, of course. WindowsKiller wrote: I don't know yet. I focused on disassembling the code to simply disable the part of the code that waits for the signals instead, but I can't do that without a copy of IDA 4.5 Advanced (the M2 ELF loader will only work with that version). Hmmm... I might, might, be able to locate that IDA 4.5. I'll get in contact with some friends and get back to you on that. I tried doing this back when we were having the discussion on assembler. It's tedious. Compounded by the fact that I couldn't seem to identify any common startup patterns between the games (except Total Vice which I don't have). Many of the routines were close, but the jumps were scattered about. I never managed to get anything to boot. I didn't know if you had tried this, but I figured if you did, you'd fair much better than I did. I have IDA advanced pro 5. If you're interested in *ahem* knowing anything about it, just PM me. jwhazel wrote: I have IDA advanced pro 5. If you're interested in *ahem* knowing anything about it, just PM me. Thanks for the offer, but I've even got a legit copy of IDA 5. However, as I already said, the M2 ELF loader will only work with IDA 4.5 Advanced (not even IDA 4.5 Standard will work). Interesting. Whats different about 4.5? I do believe I have a copy of Pro at home. I loved seeing the M2 demos of the racing game, and especially the 1st person shooter alien type game! Awesome! Does anyone have video of the other demos? There was a fighting game one w/a girl vs. some kind of dinosaur, and also one featuring a boat on the water with a dolphin swimming around. There aren't much more other videos. Only the D2 intro (which you most likely already know) and two videos of the IMSA racing game, which are the only videos to actually show real in-game graphics. Sadly, I wasn't able to find these anywhere. They were released by Gamespot in quicktime format, but they aren't available anymore, and not even archive.org saved a copy of them. It seems that amidst all the talk of D2, & Ironblood this title has been ignored. Anyone know much about it? It seems that there is a mixture of pre-rendered and real time shots here. Did this actually run on M2 hardware? I'd love any info! Wow! I've never seen any of these shots before Is this the same demo with the dolphin swimming by the yacht near the waterfall? These scrrens seem much more cartoon like? There are more shots if you want to see them. On a seperate note, M2 kiosk programs. Did Tylenol ever sign on to use M2 hardware? I heard this from another 3DO collector (whom I invited over here to the forum ... hope they join) but I would love to get it confirmed by someone else. This is the scene that I remember seeing. I think it looks quite different from the other one. Thanks. Damn man, this is what I am talking about. People were afraid that the Playstation was going to outdo that? Matsushita could have done it if they advertised. The M2 could have been a huge success. If people were buying the N64, they would have bought the far superior M2 system. A lot of these are probably renders, though, so who knows what the games really would have looked like. Are the dolphin demo screenshots real-time? I think the behind-the-back views probably are, but the others probably aren't. Anyone who reads japanese and is intrested, I can post the article about the creation of the Dolphin demo. I found the above picture with the metalic dophin refered to as the 'dolphin demo' many times. As I recall though, this is just from transition in a video from a 'game graphics' segment to FMV in a demo. Trev wrote: On a seperate note, M2 kiosk programs. Did Tylenol ever sign on to use M2 hardware? I heard this from another 3DO collector (whom I invited over here to the forum ... hope they join) but I would love to get it confirmed by someone else. Tylenol signed on using original 3DO techology for the kiosks. There are M2 kiosk discs advertising cars that were sold as a package deal on ebay years back. But few titles, like PonPon, some informational kiosk discs and the demo for the 'Digital Dance Mix Namie Amuro' game for example, are the only instances of M2 hardware being used for much of any reason outside of the Konami arcade hardware. Don't forget the coffee vending machines. Any additional info? I've read about the dance game demo before, but I've never heard of PonPon. Also, what were some of the other info kiosk discs?